The second commemorative strike the United States Mint released in 2004 was the 2004-P Lewis & Clark Bicentennial Proof Silver Dollar. The coin celebrated the 200th anniversary of the start of an expedition through the newly obtained Louisiana Purchase. Led by Captains Meriwether Lewis and William Clark (for which the expedition is known by today), the military journey charted the new land while making contact with many Native American nations along the way. The US Mint places a surcharge on the sale of each commemorative. Funds raised are forwarded to organizations dictated by the legislation which authorized the coins. Struck from 90% silver, each Lewis & Clark Silver Dollar has a diameter of 1.5 inches. The US Mint released the Proof Lewis & Clark Coin on May 12, 2004. The initial price charged for the Lewis & Clark Proof Coin was $35.00. 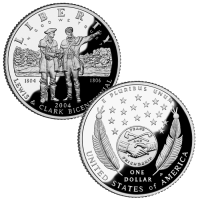 Each Lewis & Clark Silver Dollar was struck at the US Mint’s facility in Philadelphia and show the ‘P’ mintmark. 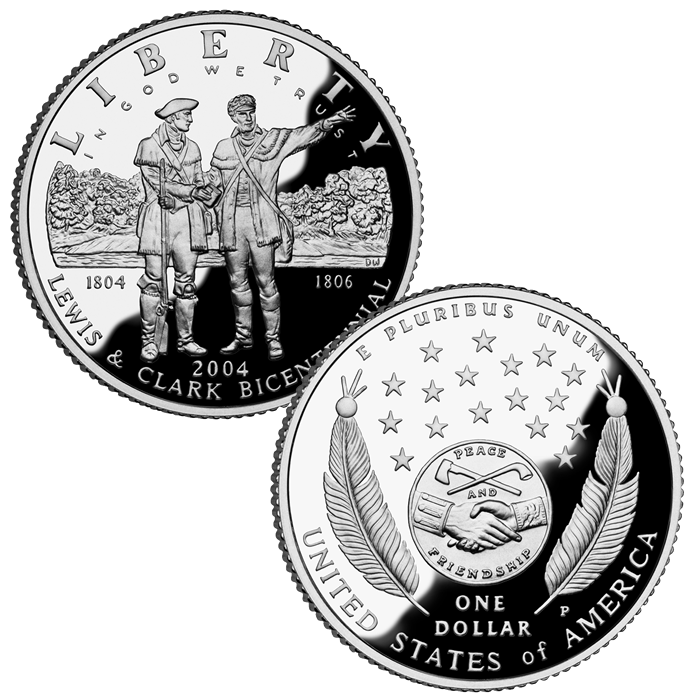 United States Mint sculptor/engraver Donna Weaver designed and sculpted both the obverse (heads side) and reverse (tails side) of the Lewis & Clark Silver Dollars. The obverse depicts Captains Lewis and Clark on the banks of a stream planning another day of the expedition. The reverse features two feathers representing the many Native American Nations contacted by the Lewis & Clark Expedition along their way. At the center is an image of the Jefferson Peace Medal which the team gave to the Indians as they met them.